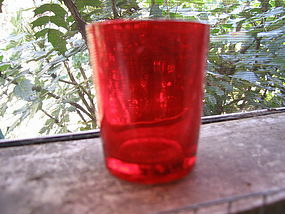 This is a ruby flash finish votive. 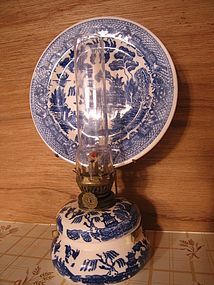 It is 2 5/8 inches in height and 2 inches across the top. There are no chips, cracks, breaks or rough rims, but does have some loss to the red finish. It has only been displayed, but not used. 7 are available and priced individually. I need your zip code to calculate the postage. 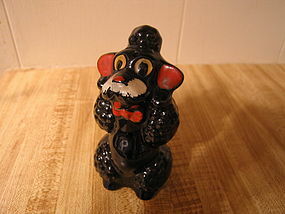 Vintage shaker with black poodle in begging position. It has very large eyes and has a painted red bow tie. Not marked, but believe it was manufactured in Japan. It is slightly over 4 inches in height. Still has original rubber stopper. No damage, but has minor loss to the finish. 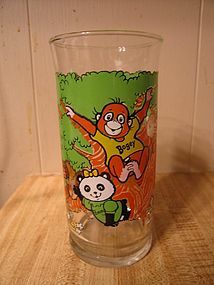 I do not know the manufacturer or pattern name of this glass. 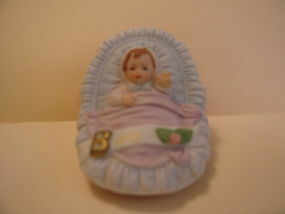 It 3/4 inch gold band with finely embossed images of geese, deer, pheasants, bass and swordfish. It measures 5 3/4 inches in height. It has a very heavy base (height 3/4 inches). 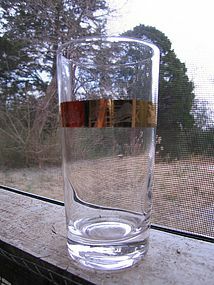 There are no chips, cracks, breaks or rough rim, but does have loss to the gold band. 4 glasses are available and priced individually. Additional photos for identification purposes available by email. I need your zip code to calculate the postage. Vintage wooden rabbit chef set manufactured in Japan. 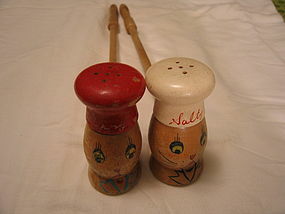 These have long handles, much like barbecue shakers. The wood is sound and the handles secure, however, as seen in the photo, there is age related loss to the finish. They also need to be cleaned, but due to the age, have been reluctant to do so, for fear of damage. I need your zip code to calculate the postage. 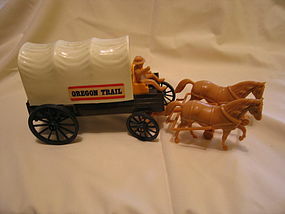 Vintage toy, which is unmarked, but matches my Oregon Trail wagon that is marked Processed Plastic, Montgomery, Ill. There is a Wells Fargo decal on one of the doors. The doors open on both sides. There are no cracks or breaks, but has some superficial usage marks on the surface. Including the horses, the length is approximately 11 1/2 inches. I need your zip code to calculate the postage. Vintage Conestoga wagon with attached horses, marked Processed Plastics, Montgomery, Ill. It measures 11 1/4" in length. There is an Oregon Trail sticker on one side. The set has no breaks or cracks, but has a few superficial scratches to the surface. 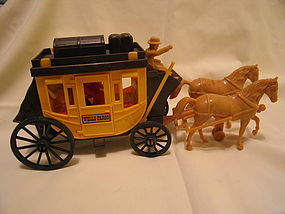 The matching Wells Fargo Stagecoach is available and priced individually. I need your zip code to calculate the postage. As always, when I need a flower identified, I consult my sister. In her expert opinion, the blossoms on the vase are Quince. I'm not sure of the bird, as only the back feathers are blue. 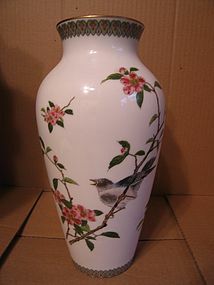 This vintage vase is backstamped Shibata, Japan fine porcelain. It measures 12 inches in height. There is no damage and comes with the original box. I need your zip code to calculate the postage. 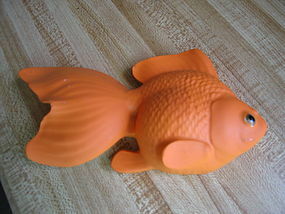 Vintage orange wall hanging fish. Looks like a blowfish, but could be mistaken. Has a sticker from Japan with a winged horse and "chase" on the back. It measures 7 3/4 x 3 3/4 x 2 1/2 inches. There are some tiny areas of loss of finish and the back shows age related crazing. 2 are available and priced individually. I need your zip code to calculate the postage. 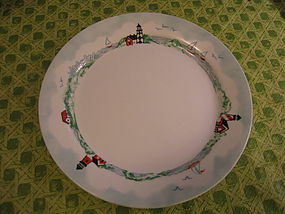 Luncheon plate measuring 9 inches in width. Very little sign of use. 2 plates available, as well as 1 dessert size. I need your zip code to calculate the postage. 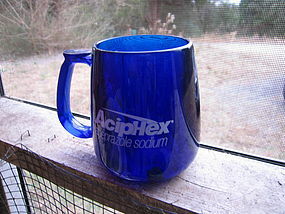 Cobalt mug or cup measuring 4 3/4 inches in white. It is an acrylic material. Minor wear to the white lettering. The photograph is not showing the deep cobalt color. 2 mugs are available. I need your zip code to calculate the postage. Pedestal mug, which is sometimes called grandmother's cup or mug. It measures 5 1/4 inches in height. There is no damage. I need your zip code to calculate the postage. 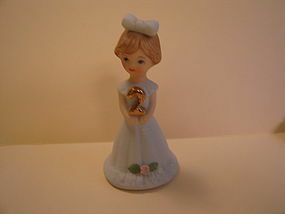 It is only marked as Enesco Giftware 1987, but I think it is part of the Enesco Growing Up Birthday Girls series. No damage, but displayed. I need your zip code to calculate the postage. Brunette figure in age four. Dated 1982. No damage, but displayed. Other in series available. I need your zip code to calculate the postage. 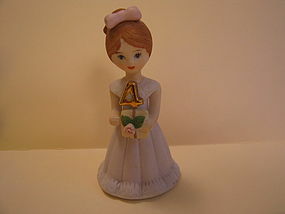 Brunette figurine for age five. It was manufactured in 1982. There is no damage, but has been displayed. Other ages available in series. I need your zip code to calculate the postage. 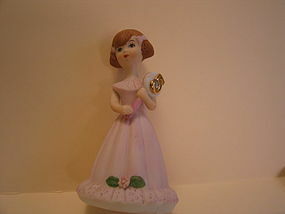 Brunette figurine dated 1982. There is no damage, but has been displayed. Other ages in the series are available. I need your zip code to calculate the postage. Marked as Corning Microwave Plus MW-85 Brown Grill USA. 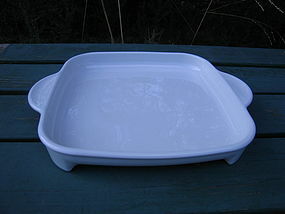 This is the smaller size of 11 (including handles) x 9 1/8 inches. It is supported by 4 feet. There is no damage. I need your zip code to calculate the postage.